This animation above the image immediately above is a Safe For Work version of a Ukrainian Woman Sharpshooter in the HOT Shot Brigade practicing her markswomanship while her fellow brigade members watch and await their turns to practice in the same way. "We know we'll face stiff opposition, our entire array of weapons will enable us to prevail. We don't wear body armor because it would block our special weapon utilizing the visible-light portion of the electromatic spectrum which has long been known to have an extremely discombobulating effect on adversaries who are men or womyn." "And from our spies with good connections with Putin's mistress, we know the Russian troops share the same vulnerability to our visible-light weapon as does Putin. "When we will ultimately achieve victory when Putin is Putout of Office. So, you'll take only half of Ukraine if we force Ukrainian women to wear tracking bracelets so you can get your hand on their firearms. Tracking bracelets, yes, but I want to get my hands on their guns. Click here or image above for larger version. 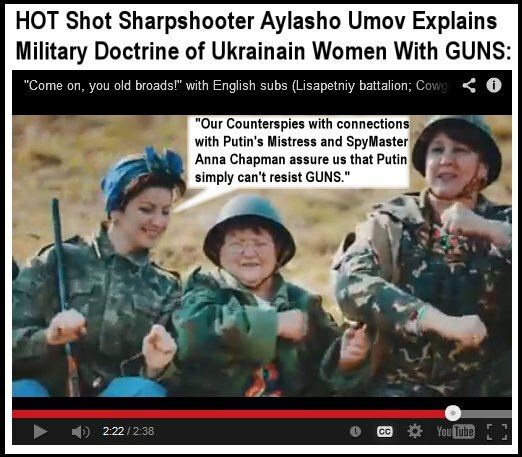 on Ukrainian Women brandishing their GUNS.